After losing her role as chairwoman of the Senate Higher Education Committee, state Sen. Judith Zaffirini, D-Laredo, said she is "not disheartened" and will continue to make higher education a priority. After concluding his remarks at the Texas Higher Education Leadership Conference in Austin on Thursday morning, Gov. Rick Perry turned to introduce the next speaker. "I'm not sure there's anyone over the decade I've spent as governor and two years as lieutenant governor that's had any more impact on higher education in this state and young people," Perry said, "and that is the chairman of the higher education committee: Judith Zaffirini." But by the time Perry made his remarks, most likely out of habit, state Sen. Judith Zaffirini, D-Laredo, was no longer the Senate Higher Education Committee chairwoman. Earlier that same morning, Lt. Gov. David Dewhurst announced a reshuffling of the Senate leadership. 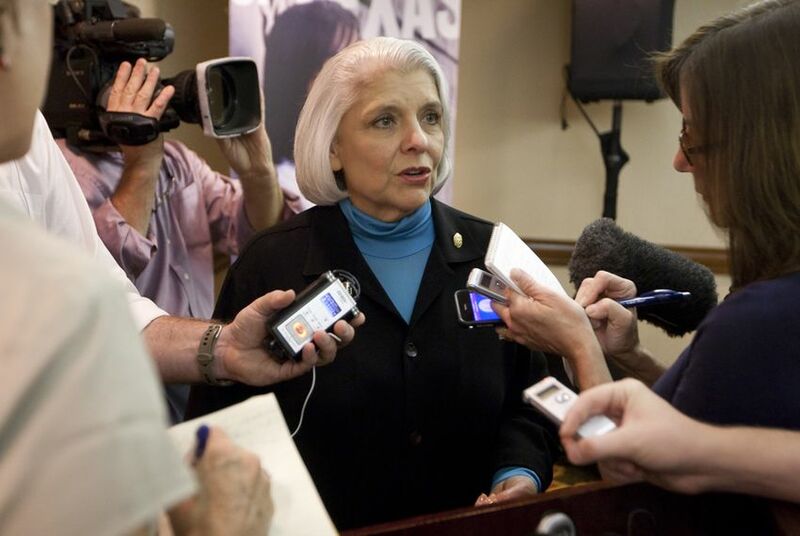 Zaffirini, an unabashed champion of the state's public universities who had fought to get the committee established in 2009 and has chaired it since, had been replaced with state Sen. Kel Seliger, R-Amarillo. "All the moves were about realigning specific members' talents to where they would be best aligned," said Dewhurst spokesman Matt Hirsch. "There are a lot of problems coming up in the upcoming session. The lieutenant governor made decisions based off where he thought senators could find conservative solutions to these problems." The announcement ended months of speculation about how Dewhurst, who many suspect may be in the mood to establish more conservative credentials after an unsuccessful bid for U.S. Senate, would deal with Zaffirini, an outspoken Democrat on a high-profile committee with a history of battling conservative reform efforts. It was a difficult calculation: While conservatives might respond poorly to her reappointment, observers noted, the senator is known for tirelessness — she regularly gets to work before dawn — and would have plenty of time to make trouble if angered or allowed to remain idle. Dewhurst's decision will keep Zaffirini both busy and out of the higher education committee chair. Zaffirini will now chair the Senate Committee on Government Organization, which is where sunset legislation — reviews of state agencies — will be directed. The new post will allow her to keep an eye on higher education in the next session, because the Texas Higher Education Coordinating Board, which hosted the Thursday morning conference, is up for sunset review. Along with House Higher Education Chairman Dan Branch, R-Dallas, she will also continue to co-chair the Joint Oversight Committee on Higher Education Governance, Excellence and Transparency, which was created in 2011. Speaking to reporters on Thursday after the press conference, Zaffirini said she was not upset with the news. "I'm disappointed in not being higher education chair, because that is my passion and it is one of the reasons that I ran," she conceded. "However, that is an immediate reaction. I am not disheartened." Zaffirini deflected questions about what signal Dewhurst might have been trying to send, but said she does not believe the switch had anything to do with her views on higher education, which famously put her at odds with Perry in 2011, or the quality of her leadership as chairwoman. "It has to do with Lt. Gov. Dewhurst using his authority to reorganize the leaders in the Texas Senate. That's certainly his right. It's his role as lieutenant governor. So basically he's changing directions." As she held court after the room cleared, rather than taking the opportunity to attack Dewhurst, she went on to praise him. "He's been so good to work with for so many years. There is nothing that I have accomplished since 2003 that Lt. Gov. Dewhurst has not been a part of," she said, echoing comments she made in September at a ceremony naming a building at Texas A&M International University in Laredo in her honor that Dewhurst and Perry both attended. "But there are 30 other senators who could and should say exactly the same thing. He's been a part of everybody's accomplishments." As a personal example, she cited Dewhurst's assistance in helping her overcome Republican opposition to secure $15 million in state funding for AIDS medication in 2005 — not exactly the sort of accomplishment one might use to burnish his conservative credentials. "There are many things for which I am grateful and areas in which he has made a significant difference," she said. In his U.S. Senate campaign, Dewhurst was repeatedly knocked by his ultimately victorious opponent, Ted Cruz, for allowing Zaffirini to chair the higher education committee, particularly because a bill that would have ended the state's controversial policy of allowing some immigrants in-state tuition failed to get through the committee last year. Zaffirini said she does think that issue had an impact on Dewhurst's decision, though she denied responsibility for the bill's failure. She said that Cruz's assertions "absolutely inaccurate" and that he "knows better." Rather, she said, the bill failed to pass the committee because state Sen. Brian Birdwell, R-Granbury, who was carrying it, failed to secure the four Republican votes on the committee necessary to pass it. "I have never, ever as a committee chair killed any bill that had the votes to be reported," Zaffirini said. "I might work against it, I might speak against it, I will vote against it, but I have never ever killed a bill in a committee I chaired that had the votes." She said she did not know how the bill, which Birdwell intends to file again, would be handled differently under Seliger's leadership. Seliger issued a statement saying he appreciates the opportunity to lead the committee: "The future and success of our state depends upon a well-trained and well educated workforce. We begin work today to try to ensure that every Texan who wants a higher education has an affordable opportunity." Looking forward, Zaffirini said her new committee will allow her more involvement in the Eagle Ford Shale boom that is occurring in her district, because the Railroad Commission is also undergoing sunset review. However, she said she will still prioritize higher education despite the change. "It will not impact my focus," she said. "It will not impact the bills I file." When asked about it, Perry indicated that he would expect no less. "She's still going to be a power to deal with in the Senate whether she's the chairman of the higher education committee or the chairman of some other committee," he said. "At the end of the day, Judith Zaffirini is still going to be a person who I pick up the phone and I say, 'Senator, what do you think about this?' when it comes to issues of higher education and other issues as well."